I have a Mills HI-TOP 10 cent 5 and 2 cherry inspected in 1946 (serial # scratched). It works pretty well; getting new springs for payout. I’m looking for information on the jackpot. My jackpot seems to be mostly complete. The release mechanism for the jackpot trapdoor works. The secondary to release the reserve into the jackpot seems to work. And it seems to reset ok (by hand, haven’t put the main mechanism back in yet). I read a post by Monti and now I understand the operation of the trip and reset for both. The problem is that it is missing the deflector that causes the jackpot and reserve to fill, so coins go directly into the coin box. I don’t have a really good diagram nor operational reference to see exactly what is missing. There is a door deflector assembly in some pictures and a guard plate. The former seems to rotate on a shaft. The latter may screw into the two holes in the front top of my box. The second picture show a sort of Y pivoting fingers. When the jackpot is tripped, these don’t actually reach into the upside-down P slot in front of it, so something must either reach through there or hand in front. If anyone can clarify what I am missing with a picture or diagram I would greatly appreciate it. Your front jackpot assembly does appear to be missing other parts as well but hard to tell from the pictures you have posted! Here below in the first and second jpeg is a couple of pages from the old Ancient Slots Catalog, the first with the parts in a blow up jpeg and the second with the corresponding parts numbers! Item number corresponding to jpeg and also Mills numbers! Below that are four jpegs showing different angles of the jackpot assembly! Monti, thank you so much. My parts page did not have the inset. I will study all of this in detail. Thanks for your help. for the very things you have shared. Thank you for your care and generosity. I just returned your PM message as well! While I may not have as much documentation in my files as some others here on the forum I have been keeping files and literature for 35 years Plus! I'm getting closer to having a jackpot. 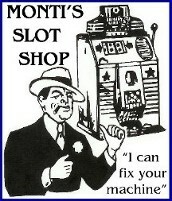 I obtained MLB-3045 from MrSlot which I called the jackpot coin deflector. I discovered that it actually attaches to my existing rod about an inch down from the top. The tang on the flap protrudes through the slot as shown in the red circle in the markup of Monti's photo. I assumed it went on the rod in the top hole, but clearly doesn't. However, there is something on the rod in the top hole and protrudes on the right in the yellow circle on the markup of Monti's photo. What the heck part is this? It's clearly missing on mine. I can't figure it out from MrSlot's part diagram or Monti's part diagram. Any help is appreciated. I haven't actually installed MLB-3045 yet so not exactly clear what it does, but seems to interact with the reserve jackpot door. Or maybe causes filling of main jackpot. So maybe my missing piece causes coins to fill reserve jackpot or drop in coin box. Hard to tell when it's not there! Really would like to get the missing piece if you can identify it for me. Thanks. Made progress cleaning this up. Sorry for the confusion as the blow up I posted was from a now extinct parts supplier AAncient Slots who had their own numbering system for parts while Dave Berten, correctly I must add, uses the MLB part numbers, but the MLB-3045 and the # 267 on the Aancient Slots parts blow up are the same part with apparently the slight difference of the spring attaching tab which you circled in Yellow! There were, I believe, two different return spring locations! That flap directs the coins to refill the reserve jackpot and when the reserve jackpot fills and the coins back up it then allows the coins to proceed to the coin can after the coins back up on to that flap and the weight of the coins causes the flap to drop to allow them to travel downward! I hope I described that correctly! Thanks, Monti. I will install it and see if it works. Mine has the long spring on the right, just dangling. I got 2 springs from Dave so I should be able to get it attached and work as you indicate. Thanks for all the information and pictures. I installed the deflector flap. As I indicated, it goes on the rod in the hole about 1" from the top; doesn't work on the top hole. 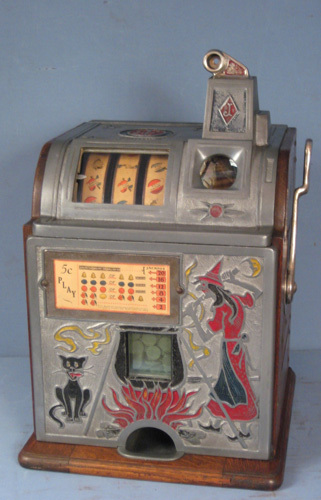 This puts it in position to fill the main jackpot, and the weight of the coins should push it back to then fill the coin box. I think that will all work now. But the reserve must get filled in some similar manner, which I think is something on the rod at the top hole and sticks out the right side top slot with the long spring. I have the long spring dangling there but nothing to attach it to. The parts list from Dave only has the jackpot door, no reserve door, so that won't have any parts to fill the reserve. Here is a page from my Fey Service Manual. The bottom door is erroneously labeled JACKPOT TRAP DOOR. It is clearly the MLB-3045 part which is the deflector for the main jackpot. The next 2 doors are indeed the (real) JACKPOT TRAP DOOR and RESERVE RETAINER. The top item DOOR DEFLECTOR ASSEMBLY is what I think is my missing stuff that deflects into the reserve jackpot. There are 2 shafts, one for the MLB-3045 deflector and one that goes in the top hole for the DOOR DEFLECTOR ASSEMBLY. Now that I have the main deflector working (a little bending required) I see that all that has to happen at the top is a deflector to point the coins toward the reserve. When the reserve is full, the coins will just bounce down onto the main deflector. If I can't find the part, I think I can make something that will work. Last edited by fgurnee on Wed Jul 25, 2018 4:09 pm, edited 1 time in total.